This is the metal album of 2013, and proof that Carcass still hold the tools of the trade to show all and sundry how to write a winning (“comeback”) album. As time passes by and popular trends cycle and mutate, the internal and external pressure pressed upon respected bands who begin to write music after lengthy sabbaticals increases significantly. This pressure piles up because the chance of a great “comeback” album is about as rare as catching a rational soundbite coming from the mouth of Dave Mustaine these day, and the fruit of the band’s labors usually highlights their middle-aged fallibility; consequentially the “comeback” album slots unremarkably behind the classics and in front of the glaring horrors of their discography. How bands handle this pressure when writing a “comeback” speaks a multitude about the intestinal fortitude of the musicians involved, and whether they cope with the pressure (not to mention whether their technical abilities still stand up) will ultimately inform the quality of the end result. To what degree of pressure death metal legends Carcass suffered from in the run up to their first album in 17 years is unknown, but judging by Surgical Steel’s incisive and instantaneously memorable songs, the band has taken the weight of anticipation by the scruff of the neck and torn it limb from tattered limb. Carcass’s colossal role in fathering repugnant genres such as grindcore, death metal, and melo-death needs little explanation, as the (medical) textbook according to Carcass has been plagiarized, bastardized, and capitalized upon by a horde of bands that formed in Carcass’s absence. So, as much as Sabbath directly or indirectly influenced every metal band that has (dis)graced our ears since the release of their earth-shaking eponymous debut, Carcass has arguably inspired just as many extreme metal bands with the band's run of Earache classics: the John Peel-approved gore of their first two albums and the band’s landmark releases Necroticism: Descanting the Insalubrious (1991) and Heartwork (1993), which followed. Thousands will tell you that 1993’s Heartwork was the last real Carcass album, as the band’s final studio album before splintering, 1996’s Swansong, has been literally tossed into the same discount bin as Celtic Frost’s Cold Lake and Cryptopsy’s The Unspoken King. The reason why fans rejected Swansong back when it was released is still the point of much debate, and metal-heads who still haven’t even heard the album continue to jump upon the bandwagon to label the album a disaster because of its reputation alone. Swansong, for all its supposed failings (which seem to be mostly centered on the reality that metal fans weren’t ready for the rock-centric version of Carcass), still has plenty to applaud (a topic for another time), and the catchiness of Swansong informs Surgical Steel’s immediacy, whether haters can hear it or not. Songs like “A Congealed Clot of Blood” and the dominant “The Granulating Dark Satanic Mills” both wield the same kind of persistent vocal hooks that confused so many back in ‘96, but the difference this time around is that the music backing vocalist/bassist Jeff Walker’s gut-busting hooks gleams with the razor sharp metallic edge of Carcass’s prime period between 1991 and 1993. Carcass’s intention for this “comeback” album is clearly to emphasize everything that fans loved about the band, as well as revitalize their style to show those who have stolen their riffs by the cadaver-full how it’s done. The sly wit and ingenious wordplay of Walker delivered with his signature throat-scraping intensity and guitarist/vocalist Bill Steer’s pinpoint melodic soloing and vicious riffs, which are extreme metal serrated and steeped in heavy metal classicism, are perfectly in place. Driving all this forward is drummer Dan Wilding (ex-Aborted, amongst others), who shows real commitment to honoring the loose yet puncturing style that drummer Ken Owen would have brought to the record were he physically able to contribute. But not only that, the 24-year-old Wilding injects the likes of “The Master Butcher’s Apron” with a lethal dose of blasting rhythmic force consistent with the enthusiasm and schooled abilities of a young metal drummer with a point to prove and legends to appease. Owen is still involved in Surgical Steel and he contributes some backing vocals and acts as a surgical advisor, and in the case of “1985” and “Thrasher’s Abattoir”, Carcass reaches fully back in time to the band’s days living on Margaret Thatcher’s breadline, with an opening pair of songs ripped and reformed from an early Carcass demo and given a 2013 polish courtesy of Colin Richardson (production) and Andy Sneap (mixing and mastering). Richardson and Sneap are another essential part of the success of Surgical Steel, as their slick touch has made Carcass sound exactly like latter-day Carcass should -- those who were hoping for Symphonies of Sickness slop ought to reconsider a few life choices. Thus, this record sounds like ‘90s Carcass without being forcibly so and there is just the right amount of contemporary sheen. The fact that Michael Amott (Arch Enemy, Spiritual Beggars), who played on heavyweights Necroticism and Heartwork, did not contribute to this album is a massive point to consider. 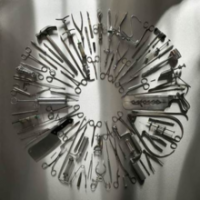 The reason being: it is clear by the stature of the songwriting on Surgical Steel that while Amott did play a substantial role in Carcass’s legacy, his input in the year 2013 is non-essential. Steer and Walker bandied together as an imposing songwriting team and have written to Carcass’s bloody blueprint, whether it be the twisted chugging riffs, sickly blasts, and grandstanding solos of the ridiculously titled “Noncompliance to ASTM F 899-12 Standard”, the sheer rush of thrash metal on “316 L Grade Surgical Steel”, or even the choice cut of Rust in Peace-era Megadeth fed through the teeth of a meat-grinder that is “Unfit for Human Consumption”. And from the opening strains of lead guitar on “1985” to the fade out of the truly ‘90s sounding, eight-minute finale “Mount of Execution”, each moment has been crafted and placed with supreme precision and sounds pleasingly familiar yet as fresh as an hour-old corpse. The biggest impression that Surgical Steel imparts is that this album has been fun to make for those involved. It is the sound of veterans who have been away from the genre that made their names creating the kind of music that fueled their youth and defined them, and doing so with a steely eye on the fact that they have a legacy to maintain and some naysayers to silence. To this effect, Surgical Steel is everything that Black Sabbath’s 13 was not. This is the metal album of 2013, and proof that Carcass still hold the tools of the trade to show all and sundry how to write a winning (“comeback”) album.